Every new fiberglass hull is released from its mold by a mold-release wax. In order to obtain proper adhesion of paint, this wax must be removed. Apply the solvent-based Wax “N” Grease Killer to eliminate wax and contaminants to get a superior adhesion when applying gel coats, primers and antifoulants. 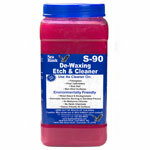 May be used as a general cleaning agent for any painting tools. Tips for Use: When apply S-80 Wax N Grease Killer, it is best to use circular wiping motions with a solvent saturate rag or towel. Be sure to follow that application with the same motion using a clean rag to remove the S-80 and any contaminants released. Safety Data Sheet (SDS) covers regulatory information including physical data, hazardous ingredients list, safety precautions, storage, handling, spill and disposal procedures, and other important safety information.